Many sleuths have made the translation from print to movie screen. Many of them have been hardboiled detectives, gentlemen criminologists and sweet little old ladies who have a flair for solving murders. But there was only one cinematic sleuth who managed to fit her detecting in between getting her homework done- Nancy Drew. And for four films released over a 10 month span in 1938 and `39, Nancy, as embodied but teen actress Bonita Granville, alternately thrilled audiences and had them laughing with her comic adventures. Teen-sleuth Nancy was created in 1930 by Edward Stratemeyer, founder of the Stratemeyer Syndicate and creator of such other long running literary series as the Hardy Boys, Tom Swift and The Bobbsey Twins. As was the case with the series put out by the Syndicate, Stratemeyer outlined the books for hired ghostwriters, who had to adhere to certain format restrictions. Contractually, the ghostwriters were sworn to silence, each series’ pseudonymous author being an important part of the books’ brand. For this new series writer Mildred Wirt Benson was chosen. Stratemeyer outlined the first four Nancy Drew installments before dying on May 10, 1930. He never saw the publication of any of the books. Inheriting the business from her father, Harriet Stratemeyer would continue to provide the outlines for the series for the next several decades. In just a few short years, the Nancy Drew books had become exceedingly popular and it was only natural the Hollywood would come calling. Although initially skeptical of Nancy’s prospects on the big screen, Harriet Stratemeyer sold the movie rights to Warner Brothers studio for $6,000. Stratemeyer also used the sale to restructure her writers’ contracts, cutting them out of any profit sharing from any potential further use and resale of their stories. Wirt Benson was asked to, and did, sign a special letter to Warner Brothers giving up any right to royalties from the Nancy Drew film series. The resultant film series was overseen by producer Bryan Foy, head of Warner Brothers’ B-movie unit. Known on the lot as “Keeper of the Bs”, Foy had a full plate, overseeing 20 films that were to be released in 1938 for the studio. Among those films were entries in the studio’s Torch Blaine series, comic b-movie mysteries which were solved by a fast talking woman reporter who often outsmarted her police detective boyfriend. Perhaps hoping to strike a similar light-hearted tone, William Clemens, who had already helmed a handful of installments in the studio’s Perry Mason series as well as Torchy Blaine In Panama (1936), was tapped by Foy to direct the new Nancy Drew series. Although relatively new to the studio, screenwriter Kenneth Gamet also had a Torchy Blaine film – 1937’s Smart Blonde – to his credit and was assigned to scripting Nancy’s big screen adventures. 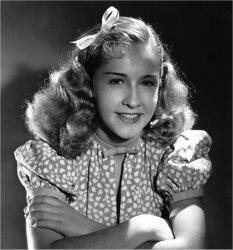 For the role of Nancy, the studio turned to spunky fifteen year old actress Bonita Granville. Born into a show business family in 1923, Granville was already a seasoned screen professional with 21 films under her belt at first RKO Pictures and then Warners. Only two years earlier, she had received an Academy Award nomination for Best Supporting Actress for her role as a school girl who spread scandalous lies about her teachers in These Three. Frankie Thomas, who had already headlined A Dog Of Flanders (1935) and the serial Tim Tyler’s Luck (1937), was cast as Nancy’s long suffering boyfriend – who underwent an inexplicable name change from Ned – Ted Nickerson. Rounding out the cast were John Litel as Nancy’s attorney father Carson Drew, Renie Riano as Effie, the Drews’ housekeeper and Frank Orth as River Height’s chief of police, Captain Tweedy. 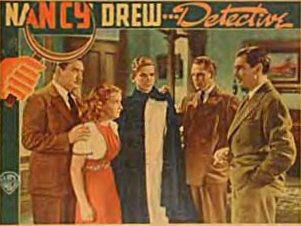 Filming on the first film in the series, Nancy Drew – Detective, began in February 1938. Released on November 19, 1938 and based loosely on the book The Password To Lockspur Lane, Gamet’s screenplay has Nancy trying to solve the mysterious disappearance of Mrs. Eldredge (Helena Phillips Evans), a rich widow who was set to endow Nancy’s private school when she vanished. The trail ultimately leads to a secluded house near Sylvan Lake. But will Nancy and Ted be in time to prevent Mrs. Eldredge being murdered for her fortune? Convinced they had a winning new series on their hands before the first installment had even been released, Warners ordered a second film, Nancy Drew… Reporter, into production almost immediately. Released almost three months to the day later on February 18, 1939, the second film finds Nancy working at the local newspaper. While covering a murder inquest, she becomes convinced that the accused (Betty Amann) is not guilty, despite the amount of evidence to the contrary. With Ned in tow, she sets off to uncover the real murderer. 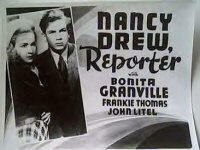 Nancy returned to Sylvan Lake in the series’ third entry, Nancy Drew… Trouble Shooter, released on June 17, 1939. Taken there by her father for a vacation, Nancy soon discovers that Carson is there to try and clear the name of his old friend Matt (Aldrich Bowler) of a murder charge. When Nancy isn’t sticking her nose into her father’s investigation, she’s turning it up at her father’s sudden interest in the lovely Edna Gregory (Charlotte Wynters). Probably the jokiest film of the series, slapstick is played up to the detriment of the mystery storyline. After the previous two studio-generated plot lines, the fourth installment of the series went back to the original book series for Nancy Drew And The Hidden Staircase released on September 9, 1939. In what would be the series final installments, Nancy investigates a murder at the mansion of two old women who want to donate their home to a children’s hospital. Warner Brothers’ Nancy Drew turned out to be much different than her literary counterpart. The cinematic Nancy was very much in the mold of other movie heroines of the day- a slightly ditzy, high-strung gal who often found herself in trouble over head. Granville’s Nancy relied more on blind luck and her “woman’s intuition” than in any real sleuthing or deduction skills. She’s willfully disobedient of her father at times, to the point where she sends her father a fake telegram in Hidden Staircase to get him out of town. Poor Ned/Ted doesn’t fare much better, often baring the brunt of Nancy’s harebrained schemes. In Reporter, Nancy has Ted disguise himself as boxer in order to get some information in a gym, but some how finds himself in the ring with a real champ. In Trouble Shooter, he risks his life charging into a burning building to try and save some important evidence, though he’s foiled by one of the film’s villains. In both Detective and Hidden Staircase, Ted finds himself in drag. Furthermore in Hidden Staircase, Nancy constantly drags Ted away from his summer job delivering ice to help with her investigation and then when he balks at her request, she threatens to tell his employer that he’s been goofing around on the job. The last shot of the whole series is Ned being drug off to jail by Captain Tweedy for obstruction of justice for going along with one of Nancy’s schemes. But whether the films helped boast book sales or not, the series ended in 1939 as Granville’s contract with Warners did. The actress left for greener pastures, and better roles, at Metro Goldwyn Mayer. Although Hidden Staircase received the best reviews of the series, it was decided to not recast the role and any plans for further films were abandoned. 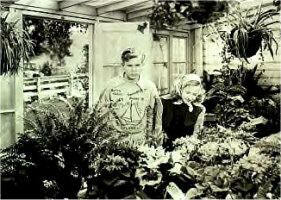 Granville’s career flourished as she moved into more adult roles in films including Now Voyager (1942) and two installments of the studios long running Andy Hardy series with Mickey Rooney, though she would still appear in some lower budget features, such as the luridly-titled propaganda piece Hitler’s Children (1943). In 1947, Granville married oil millionaire-turned-producer Jack Wrather, whom she met while starring in The Guilty for Monogram Pictures. Although she retired from acting in the mid-1950s, she served as a producer on Wrather’s Lassie television series. Frankie Thomas’ career also headed towards the emerging medium of television. After serving in both the Coast Guard and the Navy during World War II, Thomas headed to New York City to act in the burgeoning live television field, first in the first soap opera A Woman To Remember and then more famously as the star of Tom Corbett, Space Cadet. John Litel continued his busy career as a character actor, including a stretch as another famous patriarch in the long running Henry Aldrich series at Paramount. Despite her popularity with readers, Nancy Drew remained conspicuously absent from movies and then television for nearly the next four decades, until the premier of the Pamela Sue Martin television series in 1977. Perhaps Stratemeyer was unhappy with the ditzier, bubblier version of Nancy as depicted in the Warners pictures or maybe she was convinced that such translations wouldn’t boast book sales. But whether or not the Nancy Drew that hit the screen in 1938 and 1939 was entirely faithful to the her literary progenitor, the four installments of her big screen adventures have entertained audiences for far longer than a series of disposable b-pictures were ever expected to.